One subjects per set, water-slide decals, with coloured painting and markings guide. An interesting set of markings for an unusual airline selection covering a wide period of civil aviation history. Nicely printed and backed with more than adequate instructions. The rough surface finish does need to be removed with a soft cloth. I would recommend this sheets to any airlines modeller in the popular 1/144 scale as they represent an interesting range of slightly off-beat aircraft and schemes. A company I am not familiar with but, judging by the product numbers, they have been around for a while. A quick check with Lord Google revealed an enormous range of !/48, 1/72 and 1/144 scale sheets for, predominantly US WWII aircraft but also a goodly coverage of British, French and Luftwaffe subjects. While the originate in Brazil, the sheets seem to be mainly distributed by High Planes Models - HPM Hobbies, originally an Australian company now operating out of Singapore. Anyhoo, back to the review samples, which are a variety of 1/144 airliner subjects with a Brazilian flavour, being examples from the VARIG fleet across the years. I knew nowt of VARIG but a search on Wikipedia revealed it to be Brazil’s oldest airline, starting in 1927, with a period between 1965 and 1990 when it was Brazil’s only international operator. A bit of an internal kerfuffle, the rise of competing airlines ( VASP, TAM and GOL) and threat of bankruptcy in 2005 saw it divided into two parts, the ‘old’ Varig continuing to operate until 2010 whilst ‘new’ VARIG was acquired by GOL Airlines and continued to fly under VARIG colours until late 2009 when it switched to GOL Group markings and serials, predominantly orange. 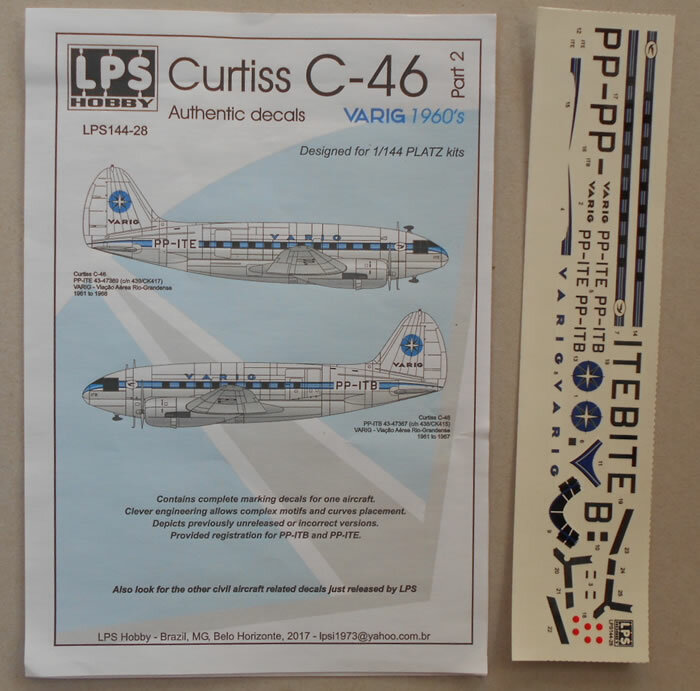 First up are three sheets for the Platz Curtiss C-46. Curiously Part 3 is numbered LPS144-05 while Parts 1 and 2 are numbered LPS144 -27 and 28! 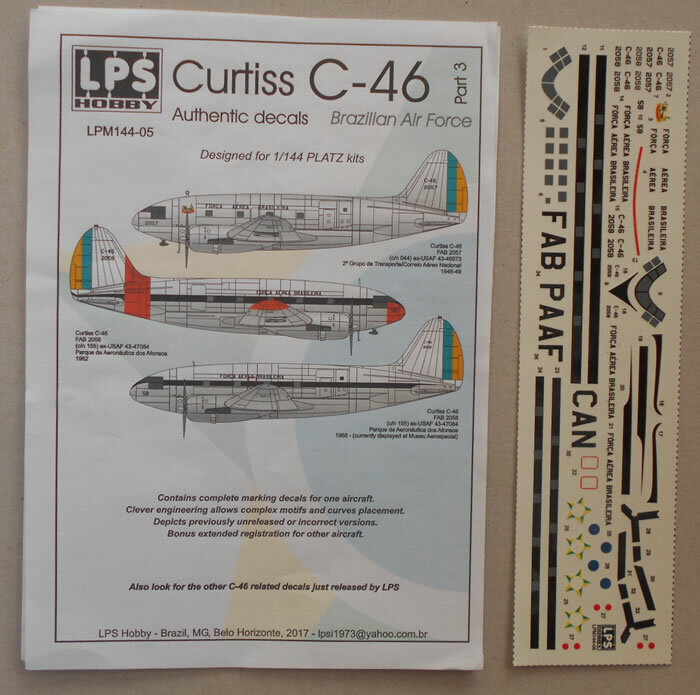 LPS144-05 Part 3 covers three C-46s of the Forca Aerea Brasileira. Although the cover states that only one model can be completed I reckon that the clever modeller, using paint/masks and coloured decal film, could complete two different aircraft if he/she had access to some suitable Brazilian roundels. This is because there are two sets of windows and cockpits and a multitude of serials and FAB lettering. All aircraft need to have the green/yellow rudders painted by the modeller. All aircraft are NMF, one all over with a colourful cockpit cartoon character, while two have white fuselage tops, one with dayglo patches stripes and wing-tips. 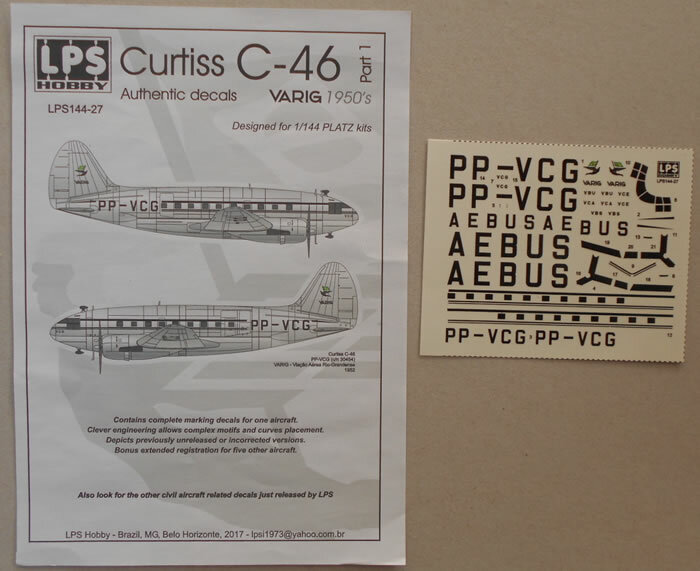 LPS144-27 Part 1 contains complete markings for a VARIG C-46 in the 1950s. This time you can only produce one scheme, NMF all over, but there are serials for all of the six airframes in use at that time. Again all windows and some stencils are provided. LPS144-28 Part 2 . As above , there are decals for one VARIG C-46 , this time from the 1960s. Now the aircraft had white fuselage tops and plenty of attractive blue cheat lines and large VARIG logo on the tail. 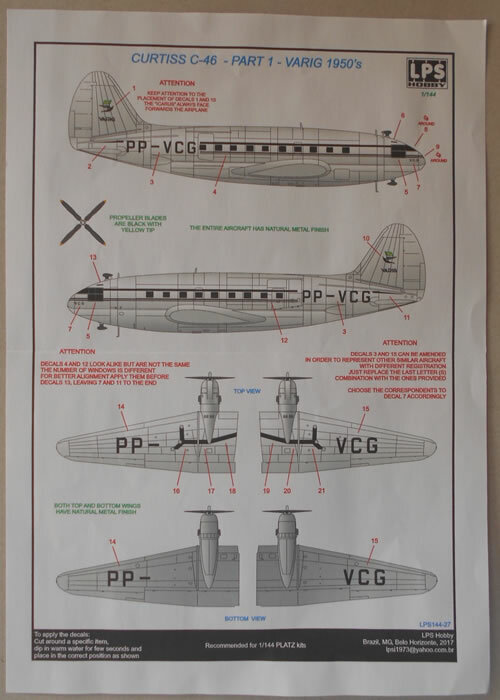 The modeller has a choice of either PP-ITE or PP-ITB, probably the last C-46s left in the fleet and used on internal flights. 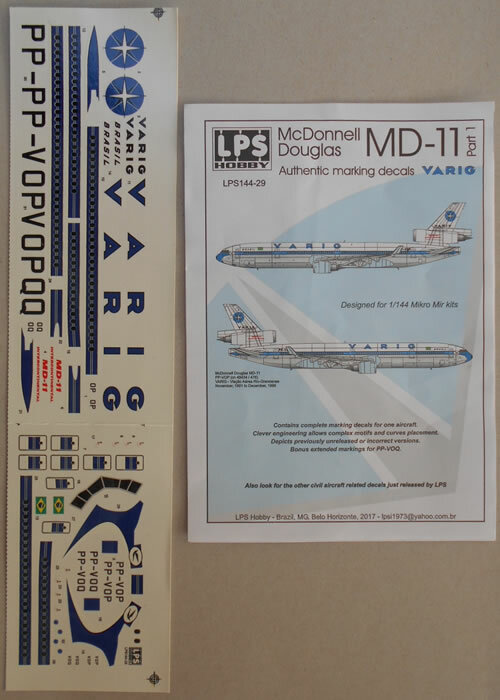 LPS144-29 covers a tri-jet of ‘old’ VARIG, a DC10/ MD-11 from some time in early Noughties. These were acquired to enable VARIG to reach Europe without a fuel stop. These are large and colourful markings fro the MikroMir kit but presumably will fit other kits of this aircraft (?). A choice of either PP-VOP or PP-VOQ is provided on this large , 70x300mm sheet and printing looks good although there is no indication of who did it. Colour instructions show all decal locations and wing panel colours. All doors and windows and some fine stencilling are present in decal form and this sheet will enable you to add a colourful and unusual scheme to the display shelf. LPS144-30 veers off the Brazilian theme and presents a Boeing 787-9 Dreamliner of AIR FRANCE designed for the Zvezda kit. Again, a complete set of markings for a single aircraft are provided , with a choice of either F-HRBA or F-HRBB in 2016. 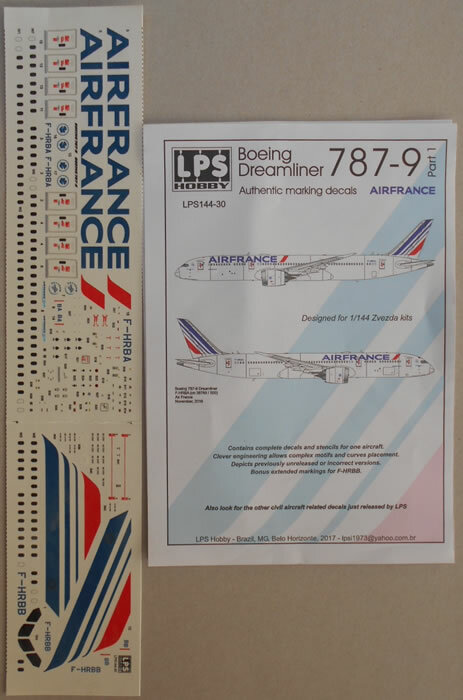 This large sheet, 70x300mm, covers the tasteful all-white scheme with the large AIR FRANCE on the fuselage and the swept red, white and blue tail stripes. Again all windows, doors and some stencilling are provided. One peculiarity with all of these decals is that, while beautifully printed, they all exhibit rough-to-touch finish. This seems to be some kind of grainy printing residue which is quite off-putting and patchy but, and this is the good thing, it does rub off with a soft cloth - I used a handkerchief to good effect - sorry, dear! !